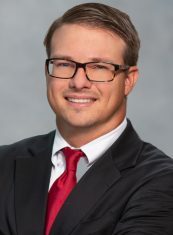 Joseph “Joey” Naberhaus is a litigator in Dean Mead’s Viera office. His practice includes trust and estate litigation, guardianships, commercial/business litigation and real property disputes. He also has experience representing hospitals, physicians and other healthcare professionals in administrative proceedings before the Florida Department of Health and the Agency for Healthcare Administration, as well as counseling clients on a wide range of insurance coverage matters.